It was my first time in Nova Scotia. This is on the Atlantic coast of Canada, and it’s the youngest of Canada’s cool climate wine regions. 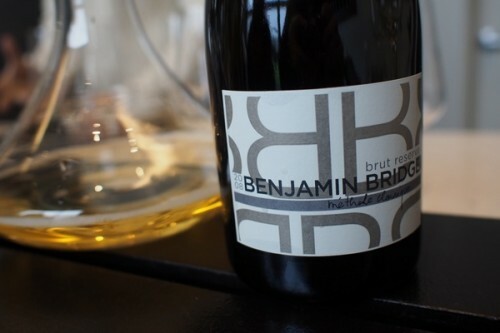 I was here to visit Benjamin Bridge, the sparkling wine producer that’s making waves, and has the reputation of being Canada’s finest sparkling winery. 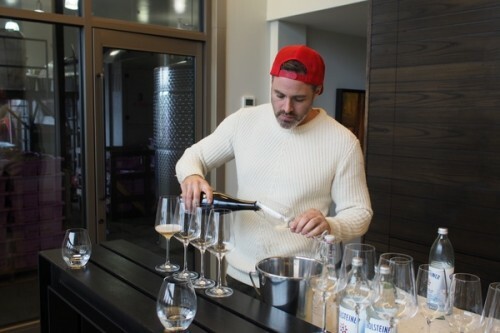 I was travelling with three sommeliers from Toronoto: Krysta Oben, Jay Whitely and Jake Skakun, and our merry tour guide was Nicole Campbell of Lifford, who represent Benjamin Bridge in Canada. Our first evening was spent exploring Halifax, in the company of Chris Campbell and Jean Benoit Deslauriers, the winemaking team of Benjamin Bridge. We began in the Stillwell Beer Garden, which is a lovely outdoor space, and then progressed for some dinner at Little Oak, which has a really good wine list. Gimonnet’s Cuis went down well, as did a Tempier Bandol Rosé and the Lapierre Morgon 2015. We then headed off to Obladee, Heather Rankin’s place, which also has a really good wine list and some nice beer. Overnight was in the lovey, grand Lord Nelson hotel. Then it was off to the Gaspereau Valley, about an hour’s drive. This is where Benjamin Bridge is located, and it has a unique microclimate that enables Vitis vinifera to ripen perfectly to create sparkling base wines. The valley looks pretty stunning, although we had a day of solid, heavy rain for our visit. 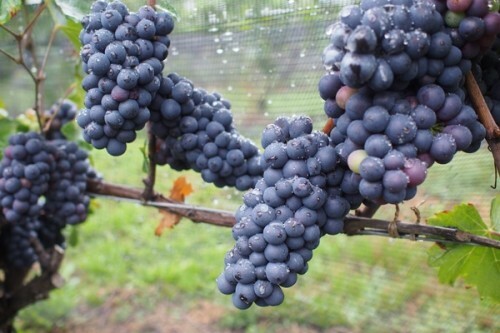 This was welcomed, though, because the previous few months had been really dry, and the vines needed this extra drink to set themselves up for the last push to ripeness. 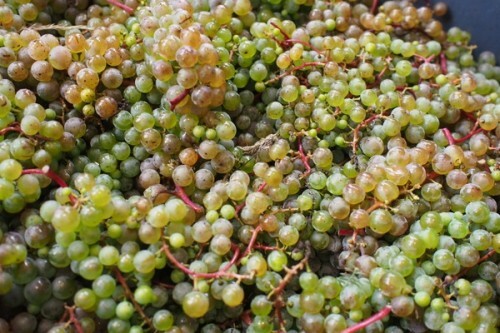 Harvest was underway for some of the hybrids, such as L’Acadie Blanc. 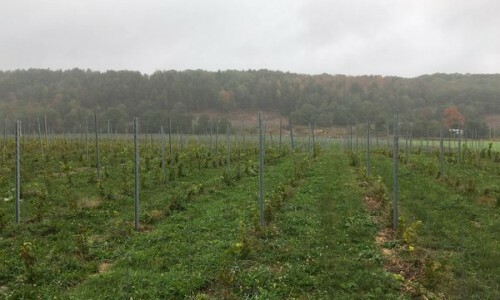 Until recently hybrids were the rule here, because the cool climate and winter low temperatures make growing vinifera varieties properly marginal. Benjamin Bridge is the vision of Gerry McConnell. He has an interesting story. Growing up in a humble background in Halifax, Nova Scotia, he worked hard to put himself through law school, getting a scholarship. When he began practising law in the 1970s he saw that a lot of large companies had moved manufacturing plants to Nova Scotia because of the lack of labour laws, which meant that they could save money by exploiting the workers. So his focus was on labour law and he helped unionise the work force and campaign for better rights for the exploited workforce. Then he decided to go into business, and saw an opportunity for gold mining. His NovaGold operation became huge, and he sold it, remaining on the board. When the current batch of plantings is complete, there will be close to 90 acres under vine here. Scott Savoy, the viticulturist here came on board in 2015 and he’s been looking to remodel the vineyards, planting at a higher density and getting each vine to do less work, moving from 3 kg per vine to 1.5 kg. The wines? They’re quite lovely. There’s a precision and freshness here, but it’s allied to real depth of flavour. Very interesting. 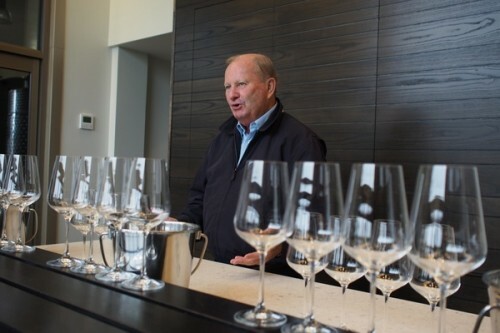 I was last in Nova Scotia about 25-30 years ago, and the state of wine there was horrendous. For starters, there were no good wine lists because there was basically no decent wine being distributed. We ate at one restaurant that was owned by a French couple who hadn’t realized how bad the wine distribution system was when they moved from France. In order to put something on their list they had to convince the NS liquor board to carry it. And then there were the wineries, which were trying but not particularly successfully. I had the 2011 Brut last night. Bracing acidity, sour profile, green apple. V v dry, not my style sorry! Just visited the winery Fall 2018. Some very impressive developments.